All started from the 16-year-old Soichiro, and did not want to continue school. Because he thought the school was a waste of time. He just wanted to explore about the engine. Finally, his father, who understand very well about his ambition to introduce to a friend in Tokyo called Kashiwabara, a director of a car repair shop called Art. Finally in March 1922, Soichiro escorted his father to Tokyo to work there. But not as a technician or in connection with the machine, he was just a baby sitter. He infants parenting workshop was the son of the director of Art. From there his knowledge of the developing machine. He stole time at the repair shop close to just look at and analyze the car's engine. Especially when he finds a book in the library, and collect his pay money just to rent the book. The first book he read was The Burning System. One day, when Soichiro was mopping the floor, he asked his employer to assist in the garage, because the shop was busy that day. And here he shows his ability to fix a car engine Ford Model T which was issued in 1908. With his knowledge sneak peek time for just the engine and the knowledge he could from books, he eventually managed to fascinate the other technicians. At age 18, he went to town Marioka to fix a car engine. Being young, up-to pickup astonishment. "Master of his Art workshop to the toilet is not it?" Asked one of two pickup, because it does not believe that he just picked the young teenager. "I am the one you mean, thanks for picking me up" said Soichiro relaxed. Hihihi .. funny if you saw the face of the second pickup. Amazement of the technicians did not end there, as he began to unload the car too, many who do not believe he could put it back. But it turns out, he managed to fix the car. With these achievements, at age 22 he had become head of the Art workshop, and is believed to open a branch in the city of Hamamatsu. In 1928 became head of the workshop Soichiro Hamamatsu branch of Art. The workshop was originally only had 1 employee, but after three years of existence, already has about 50 employees. During this period, car repair problems left to subordinates who are given advance knowledge of the machine. While Soichiro just check the work of his men, and concentrate on increasing creativity and knowledge in the field of machine. As head of the workshop, she famously fierce and loud. He did not hesitate to hit the head of his men with a screwdriver or wrench (as seen in the book, whether it's true or not). Of all employees, there are two classes. Which one is the last and had fled. And usually, those who survive are the ones who became a reliable technician. In the past 3 years, Soichiro make veleg car made of iron. In those days, veleg car made of wood, so if used in a long time, it will loose veleg shaft. In 1933, Soichiro was already starting to make a race car with his own hand, which he called Curtis. Curtis's name was taken from a machine that he uses, Curtis aircraft engine type A1. With a homemade car, he had won the race but only as a navigator, not as a racer. In the same year, Soichiro married with Sachi, a woman is educated. The presence of an educated Sachi, for Soichiro who did not undergo formal education to be huge. Sachi is not only a role as a wife, but also teachers who teach manners and basic sciences. But most of the meaning is understood about how Sachi Soichiro interest in the field of engineering. In 1934, Soichiro planning to make your own car. Instead of taking the car from famous brands at the time. It was his intention to live by first making a piston ring. In 1935, right next to the garage Art he made the sign Piston Ring Research Center of Art. Piston ring made Soichiro always fail, because he did not understand the problem of mixing metals. Because homemade is always a broken piston ring or scratch the walls slinder. Finally he came to Hamamatsu High School majoring in engineering, and was told that there is another mixture that is required to make piston rings, such as silicon. With the information he received, he finally got the unanimous determination to continue their education, despite the 28-year-old Soichiro. Finally, three years later, on 20 November 1937 piston ring had made. 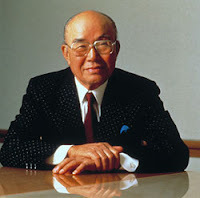 And in 1938 he founded the piston ring manufacturing plant named Tokai Seiki. While the workshop which he handed to his men headed for the run. Workshop that he founded officially in production finally in 1941 after an investor from Toyota. In 1945, right after World War 2, Japan became lower because the state is losing the war. And life-Ramanujan Soichiro be displaced. He did not do any work at that time. There is no intention to build another plant, even he only wanted to learn to play the flute at the time. In the aftermath of the war, in which objects are still very rare, it is the textile industry is growing very rapidly at that time. Reportedly, those who have a weaving machine, once the engine is moving, he could get 10 thousand yen. And when Soichiro was thinking how to make the weaving machine is more sophisticated than the here and now. He also set up a loom making factory that eventually stalled because of lack of capital. When the plant stops he made, there is a friend who is a former radio transmitter offers a machine that turned out to war activities amounted to 500 pieces. And Soichiro are asked to use the machine. After seeing the bike, he also intends to make motorcycles with engine radio transmitters. How to ride a motorcycle while it is also very different from those of today. Mesih first be heated with fire, and was encouraged at least 30 minutes, the new engine can be used. But still sells, and the current production capacity is one unit more in one day. In one year alone, 500 pieces of radio transmitters out. With these achievements, Soichiro continue to develop the bike, and been able to create a motorcycle called the Dream D, after making machines A, B, and C. Soichiro artificial motors are 2 stroke engine with 98 cc and a maximum speed of only 50 km / h. Be marketed in conjunction with the Dream D, a great marketer named Fujisawa come join with Soichiro and build a motorcycle manufacturing plant. Then later, the presence of Fujisawa brought major changes to the company named Honda. Before the Dream D marketed, Fujisawa menguju try to bike to the public. And known, because the Dream D is a 2-stroke motors, the noise is made into a problem. And thus, Fujisawa Soichiro force to make a 4 stroke engine noise sound poor. Finally, 4-stroke engine is built and managed to become number one in Japan. With a 4 stroke engine, the maximum speed is 75 km / h.